Although influencer marketing has been finding its feet for the past few years, it has taken many of us until 2017 to wake up to what it really means. Turning the traditional advertising model on its head, influencer marketing is the biggest revolution to hit advertising since the internet. Today’s biggest social stars can be counted among the most influential people in the world, affecting what we think, do, eat, wear and buy – and it’s this last one that has caught the attention of brands. Is influencer marketing word of mouth 1.0? Word of mouth is one of the oldest and most powerful ways to drive sales. Influencer marketing trends allow brands to leverage this power at scale, making the most of the trusting relationships consumers already have with their favourite online personalities. Today’s audiences expect brands to entertain and inform them. Rather than making purchasing decisions based on questionable claims made in glossy adverts, consumers prefer to connect with other people like them and find out what they’re buying. Despite the clear benefits of social media influencer marketing, some are still hesitant to get on board. Commanding hundreds of thousands per post, Kylie Jenner is at one end of the scale – but don’t let that put you off. Influencer marketing can and does work for all brands, sectors and budgets. In our definitive guide, we address the most common questions and concerns surrounding influencer marketing. In influencer marketing, the influencer becomes a brand advocate and acts as a ‘middle man’, bridging the gap between the brand and their target audience. This could mean introducing the brand, highlighting a new product, creating a tutorial, showing off a side of the brand that people might not be aware of or adopting any number of other approaches. This usually happens when the brand pays the influencer, but if you’re very lucky it can happen organically. An example of this would be the world’s #1 beauty blogger Zoella sharing a post about this flavoured coffee with her 11 million followers right before Halloween. The discipline has evolved so that we now trust influencers as much as we do our friends – they are our trusted sources of recipes, tips, inspiration and advice. Occasionally influencers collaborate with brands directly, creating a product line, event or service with the brand – then promoting it to their followers. This usually happens when larger brands are working with larger influencers. More often the influencer will use create content based around their experience with the product or service and feature the brand in a single post or series with a link to where people can view or buy. Sometimes they will respond to questions followers ask about the product. The idea is that followers will then be inspired to at least follow the brand, if not buy the product. Alternatively they might share the content with their own followers, who might do the same – getting the content in front of more eyeballs. Competitions: The influencer shares a post asking their followers to get involved in a competition. Going ‘live’: Influencers partner with brands on platforms like Instagram Live, Facebook Live and Snapchat to showcase events, stage ‘private’ performances or highlight products. Festival beauty blogger Sophie Hannah Richardson did this when partnering with Claire’s Accessories at Coachella festival. User-generated content: Using Brooke Shield’s iconic line “Nothing gets between me and my Calvins” from its 1981 ad, Calvin Klein got celebrities like Miranda Kerr, Justin Bieber and Iggy Azalea to share posts of themselves in their CK underwear, filling in the blank “I BLANK in my Calvins” and ask their followers to share their own similar posts. To date the hashtag has 518k posts. Promo codes: Simply asking influencers to share promo codes with their followers. Below we address how this can help you track your campaigns too. 2. What is an influencer? Traditionally this has mostly applied to famous people; celebrity brand and product endorsement dates back to the 1760s when Wedgwood used royal endorsements to get people interested in its pottery and chinaware. Social media changed everything, giving a platform to anyone prepared to work hard enough at growing an engaged following via their social accounts and blogs – although as we’ll explain the actual number of followers can vary wildly from account to account. Influencer marketing places the focus on these individual people rather than the target market as a whole. Being a social influencer has become a full-time, often generously paid, job in its own right. One 2017 survey of 1,000 children aged 6-17 found that 34% want to be YouTube personalities when they grow up. Fans, Freebies, Events, Holidays, Collaborations, Creativity, Freedom etc. It sounds like a charmed life – and of course, it is, but it’s not all avocados and sunbathing. Staying at the top of your game as an influencer requires effort – and lots of it. It’s all about staying relevant, replying to followers and constant posts. There are new hopefuls arriving on the scene every day and no one wants to become yesterday’s news. 2017 saw Forbes release its inaugural Top Influencers list. The list breaks down top global influencers into the following categories: Fashion, Gaming, Parenting, Fitness, Beauty, Home, Food, Travel, Tech & Business, Sports, Entertainment and last but not least, Pets! 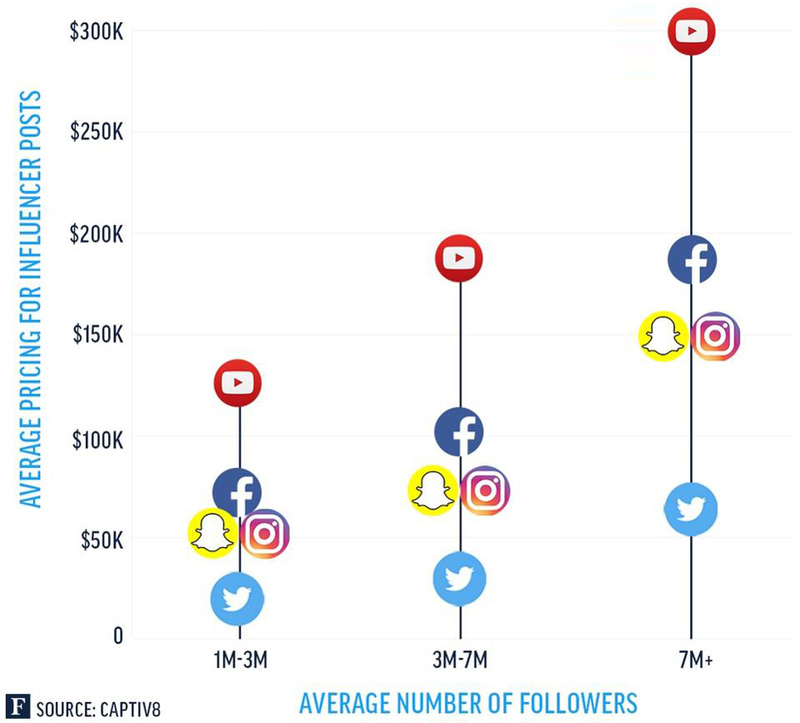 It’s no secret that influencer marketing is big business; on YouTube, accounts with more than 7m followers can earn 300k for a single post. Instagram’s format lends itself perfectly to the discipline; Instagram influencer marketing is now a billion-dollar industry. With more than 700 million monthly Instagram users. Forbes recently reported that an account with more than a million followers can now earn more than 50k for a single sponsored post. We’re starting to learn that the level of actual influence an influencer has is not necessarily relative to the size of his or her following. Interestingly, once an account grows past a certain point – the percentage of people engaging with influencer content actually takes a dip. A recent study of approximately five million Instagram posts found that as an influencer’s follower total rises, the rate of engagement (likes and comments) from followers decreases. On Instagram, for example, the ratio of likes and comments to followers peaks when an account has around just 1,000 followers. This means that a bigger following doesn’t always mean a stronger campaign. In general the bigger the following, the more choosy the influencer can afford to be with their campaigns. 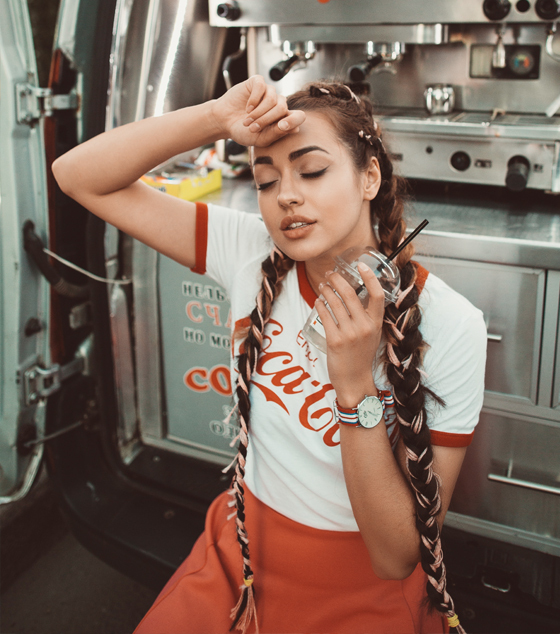 The influencer doesn’t want to risk the credibility they have worked so hard to establish with their audience by collaborating with brands that aren’t the right fit. The audience will think they have ‘sold out’ and will be less interested in what they have to say in the future. 3. What are the benefits of influencer marketing? Unlike virtually any other advertising channel, social media influencer marketing doesn’t interrupt the consumer experience. Audiences aren’t annoyed or distracted by ads popping up during their favourite TV show or at the side of their online shopping experience. Instead, they are introduced to brands and products through people they trust and are interested in. Brands know that the way they interact with and serve their customers is now in the spotlight (because of social media). Today’s consumers expect a two-way conversation. This has lead to a greater focus on authenticity as brands jostle to show customers they are in touch with their needs, as well as more transparency as social teams interact with people in real time. It’s relatively simple: Working with an influencer often relieves the pressure on the brand or the agency to come up with a big creative idea for a campaign. While creative thinking will never go out of style in marketing, the influencer is the one with the real credibility – and will often have their own ideas. We recently worked with comedy trio The Wall of Comedy to produce a campaign for YESldn (Youth Employment Skills London) – a free service which supports young people from different backgrounds not currently in employment, education or training. This campaign is a great example of how an influencer campaign with a tiny budget can get big results. The guys were passionate about the campaign from day one and got involved in every stage of the process; writing the script, shooting, editing and sharing with their audience across every platform. This made everything really straightforward and more importantly made it work, for the brand, for us, for the Wall of Comedy and for their audience. The campaign wouldn’t have worked any other way. It can be cost-effective: The budget required usually depends on the influencer and involves factors like who they’re currently working with and the level of demand and whether or not they want to get behind your product. See the section below on ROI. It boosts SEO value: The more people mention your brand on social media, the more popular and relevant you’ll be on Google. It works: Good influencer marketing campaigns work because the influencer has a level of credibility with their audience that most brands just don’t have on their own. We could have given the Wall of Comedy a script, or shot them on glossy film but we would have compromised their tone and authenticity; crucial in the mutually trusting relationship they have with their audience. 4. How do I find the right influencer? One of the biggest mistakes a brand can make when implementing an influencer campaign is choosing the wrong influencer. Being an influencer is different to being a celebrity – although the two often overlap. They might be aspirational, beautiful or talented but the point is that if the influencer bit came first, they worked hard to get there by building an engaged social following. Their lives seem within reach. Unlike celebrities, with an influencer you get the assurance that there isn’t some social team responding to questions and comments. The ultimate aim is to inspire. 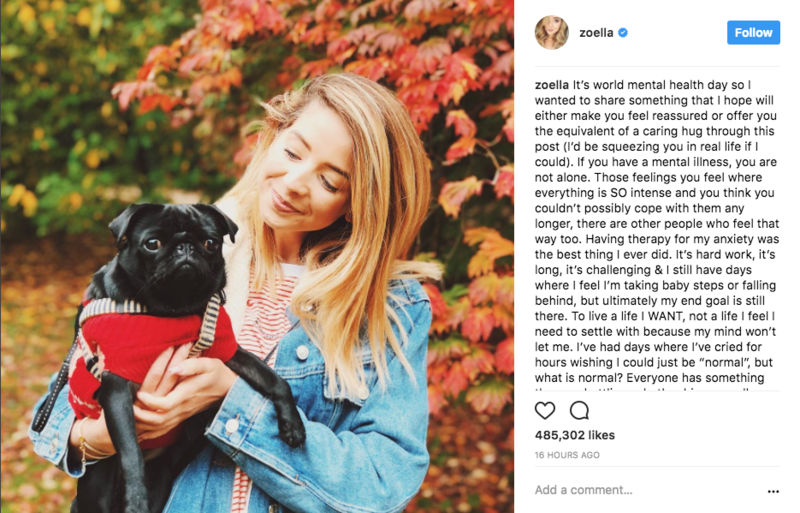 People want their lives to look like the lives of their favourite influencers and it seems like one fast-track way to get there is to surround themselves with the same things, brands, products and services. Context: Zoella won’t help you sell software. Jack Dorsey probably will – but remember that you can make waves with even the tiniest budget. Action: Is the fit so spot on that the influencer’s audience is likely to take action and buy? Once you’ve thought about all this, you could create an “influencer persona”. Spend time writing a little profile for your ideal influencer, including their age, gender, interests, the mix of content they post, their following and so on. You could even draw a picture if you think it would help – it could be a fun way to pass five minutes! When you know who you’re going after – here are some different ways to reach out to them. Go through an agency – we know a great one! 5. What are the legal requirements for working with influencers? There has been a recent crackdown on brands and influencers, particularly on Instagram. These actions are intended to rein in big business being done covertly on social media. Problems arise when paid-for promotions are not disclosed to the viewer. In certain cases this can be difficult to monitor. Sometimes engagements are authentic – the influencer may just be posting a genuine opinion about his or her experience with the product or service. If however the brand has any control over the content or offers the influencer money, a gift or any other reward – the post becomes an ad and must be clearly marked as such. Brands and influencers need to carefully consider the nature and content of posts and campaigns. Reality TV personality Sophie Kasaei was recently ordered to remove a post about Flat Tummy Tea she had shared with her 1m followers after the ASA found fault with the health claims made and the name of the brand itself in relation to these claim. Influencers are now expected to clearly mark whether or not posts are sponsored with #sp (sponsored post) and/or #ad at the beginning of the post. How do you know if your influencer campaign has been successful? As with any campaign measurement is crucial, but it can be challenging to directly tie an influencer campaign to results. In the past two years influencer marketing has become far more transparent. Things like social metrics, affiliate links and Google Analytics allow us to measure more aspects of our campaigns than ever before. Revenue is the big one: We all want to know what the bottom line is: how many pounds did we earn as a direct result of this campaign and how does it compare to how many pounds we invested in the content? The first place to look is sales: Was there a spike in sales on the date the campaign went live? Affiliate links Combining an influencer campaign with affiliate links is one of the most effective ways to track ROI. Creating a unique affiliate link for an influencer allows you to track online sales made through their social channels and blog posts. Influencers typically receive commission from these sales. Remember that affiliate links have limitations. Cookie duration for affiliate links is usually just 15-30 days. If a user views the post but doesn’t make the purchase for a long time this will be untraceable. Promo codes: Creating custom promo codes for your influencer to give out to their audience let you track purchases made “down the line” (so long as they are entered before the promotional period expires). There are e-commerce sites like Shopify and WooCommerce where you can easily generate promo codes for your influencers. Google Analytics: Analytics is one of the most powerful tools we have at our disposal when it comes to measuring ROI. Setting an “Event” goal you can track customers who visited your site via an influencer’s social channel or blog. Experiment with isolated marketing: Try promoting one special product or service through only influencer marketing and compare sales to those for other products advertised through other channels.